I’ve now spent over 40 years in the business world. Small business owners are my people. Some operate companies that do under $5 million. Others are at the helm of companies that generate well over $100 million. Every single one of them have paid some prices to be where they are. We all do. As we’ve grown older in our business careers we’ve often discovered that we were paying a price we didn’t ever consider paying. I was 27 and at the helm of a $14 million retailing company. A wife and two small children…I knew the price I was paying at the time. Forfeiting more dinners than I can count. Cancelled plans. Tardy appointments to social gatherings. Eighty hour weeks. Those were the prices I knew about. Older business people would often tell me, “Stress will kill you.” I was young and I’d chuckle under my breath because the stress gave me adrenaline. It fueled me. I loved the non-stop action of retailing and the blistering pace. Taming chaos was the juice. And I was good at it. It was the price I was paying. One day an acquaintance who worked for a supplier found himself in the hospital. He was suffering chest pains. He was just a few years older than me. Like me, he was running hard and fast. “Are you kidding me?” I said to the person who called to report the news. We both assumed he’d had a heart attack. Turns out the doctor told him he was lucky. It was an event caused by too much stress. The doctor sent him home to rest and stay away from work for a week. He also gave him some sort of diet to start and some moderate exercise regime. That was only after spending one night and nearly two days in the hospital scared out of his mind. We were all paying a price in our pursuit. Time rolled on and we all grew older, along with our kids. It wasn’t long before news of a divorce here and there popped up. More and more divorces. And by the time the kids were hitting teen and college years, increasingly there were stories of drug abuse followed by rehab. Sometimes many, many instances of rehab. Every now and again we’d be stunned with news of suicide. The price we were paying was far higher than any of us imagined. It wasn’t merely a few missed dinner dates. Or a few missed ball games. Or school plays. It was wrecking our marriages. Destroying our kids. Breaking our families. And costing some of us our very lives. That was then. In the 1980’s. And things have only grown worse because the pace has picked up steam. The intensity, too. Along with the competition. Owning a small business has always been tough. Doable, but tough. Lonely. Isolating. Some days filled with anxiety, dread and fear. Mostly, days not knowing any other way to operate. We did what we had to do because it’s all we knew at the time. You go it alone. Nobody wants to hear your problems. You sure don’t want to share your opportunities with anybody. So it’s all piling up on your desk and in your head. America grew increasingly interested in physical health during this time. Jogging and biking was the rage. Gyms started popping up. We got health conscious. That was good. But nobody was paying attention to the mental health of the small business owner. Not that we’d have listened. Thankfully, today is a new day. A better day. One where we can leverage technology and relationships. Look at your Linkedin profile and count how many connections you have with people you’ve never met face-to-face. Never before have we been surrounded and connected with so many people yet remained so ridiculously isolated and lonely with our own stuff. Dump it on your family. That’s hardly fair to burden them with it. Besides, could they really relate? Not likely. Dump it on your friends. That’s no better. For you, or them. Dump it on your employees. Well that’s not even an option. That would only make matters worse. And now you know why I hit the record button today. Mental health of small business owners has been a lifelong interest, but one that I didn’t know to make a contribution to until a few years ago. I began to look at community. And I looked carefully at my natural abilities coupled with my personality. I read. I wrote. I podcasted. I talked with people, often quizzing them about their experiences as small business owners. What I found wasn’t surprising. And it was almost universal. Except for the most pompous (who simply refused to admit it), the rest of us were yearning for community. Some safe environment where we could get some solid feedback and other perspectives as we navigated our problems — and our opportunities. We wanted to connect with other small business owners, but none of us knew quite how to go about that without involving people we already knew – people we already had relationships with. That wouldn’t work. It was time to look at the problem in a new way. Do you like tools? I don’t necessarily mean wrenches or screwdrivers. I mean technology tools like Evernote, Slack, Skype or Basecamp. We love software and apps. I just looked at my iTunes app storage. I have 251 apps that I’ve downloaded. Thankfully, not all of those are on my phone, but each of them have been — at some point. At this very moment I have almost 70 apps on my iPhone. These apps are tools ranging from Snapchat, Waze, Instagram and Facebook to Shazam and DropBox. Some I use often. Others I hardly ever use. It’s nice to have so many tools at our fingertips. We’re always finding new ones, too — that we never knew we needed until somebody comes up with one. Then we don’t know how we ever got by without it. Or we don’t know why we’d ever go back to an old tool that isn’t nearly as good. Since Waze, I confess I never use Google Maps. Small business owners are tasked with doing one thing (mostly)…solving problems. Sometimes solving the problem means finding the best opportunities. Sometimes it means hiring the best person for the job. It may mean finding the ideal location for a new store. Or maybe it’s repairing a broken culture that’s killing productivity and creating too much turnover. Problems, opportunities. It’s all the same. It’s figuring what best course of action to take based on the data at hand. 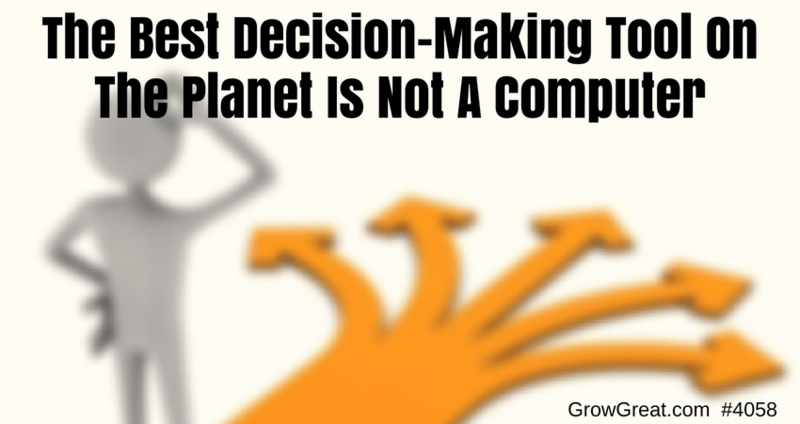 Business owners rarely get to make a decision with complete, full knowledge. We have to work with confidence, knowing that if we’ve about 70% of the information — then we’re not likely going to have time to ferret out the remaining 30%. Time waits for no owner to get to 100%. It’s just how we live our lives. What’s your current decision-making tool? It’s probably not a tool as much as it’s a process. What does it look like? I’ll describe mine – at least, the one I’ve used for over 30 years. I won’t bore you with the details. We’ll just take a high elevation look at it. First, I gather all the real evidence. The data. The numbers. It may be sales, or a price. It may be units, or years. It’s likely got many numbers attached to it. Let’s use a lease as an example. Most owners have negotiated leases or real estate deals. Or at least been the final say in them. There are terms and conditions that include how many months or years, how much rent, what’s included in the rent, what’s not, common area maintenance costs, taxes and other costs associated with it – the ones you’re responsible for (and the very few that your landlord is responsible for). All kinds of numbers. All kinds of conditions. It’s important to have them in writing so everybody has a clear understanding of what’s at stake. Part of this evidence gathering is to hire or have a real estate attorney who is an expert. Unless the owner is such an expert, we all rely on somebody else to help us navigate the legal jargon that might otherwise trip us up. Again, this is all part of getting the known facts down as securely as we can. It’s always my step one. I want to know what’s real before I start entertaining what might be possible, or even probable. Second, I’m going to involve my team (if they’re not already). We’re going to meet to discuss the pro’s and con’s of this deal. I’m going to encourage team members to debate it openly, with vigor. I want every position challenged. If somebody is in favor, I want somebody who is opposed. Then I may encourage them to switch sides and continue the debate. This is almost always impossible because people want to behave as they think I want them to…not as I really want. Understandable because they’ve got jobs to protect. At this point, I’ve involved an expert – a real estate attorney – and I’ve involved my team (it could be a few people, or it could be many people). These are people I rely on for input and advice. I need their perspective. Rarely do I get much of a contrary position. And I’m never going to be tested, except perhaps by the attorney. Third, I’m going to use these human resources to form a strategy for the very next step. These people will have given me suggestions and recommendations. It’s up to me to decide what I’m going to do. This is where the process goes from being people intensive to being very lonely. All along the way people have been involved, but they’ve all got some interest to protect and I’m smart enough to know that impacts what they say and how they say it. They’re always on guard, even if they don’t mean to. It’s at this stage that I’m likely to huddle alone and think about it some more. If I’m really brave I may reach out to a friend or trusted person in the space (in this case, commercial real estate) to get some perspective that is specific to the issue. It might be a long-time business acquaintance, or a closer friend who deals in commercial real estate. When I’m done getting their input I’m right back to being Mr. Lonely. What should I do? Sometimes there’s a clock ticking, some looming deadline. That pressure can mount and make the decision even more dreadful. If we delay too long we may lose the opportunity. Is that a good thing? Or a bad thing? How can I know? These good people need something from us. Sure, they need us to make a decision and keep them involved, but they need something else. Something that inadvertently gets in everybody’s way. It’s not intentional, or even conscious. It just IS. That real estate attorney needs our business. That’s a good thing because hopefully he’s skilled and capable. He’s driven to do a good job for me because he wants me to use him on the next deal. But he can unwittingly handle my business because I’m a client. He needs my business. There are the numbers of the deal, but there’s also the psychology of the deal. He wants to please me, to make me happy. That may alter his strategy depending on how badly I want this deal, or how badly he thinks I want it. As the owner I’m not immune from having preferences. Fact is, I have preferences I make known every single day and my attorney is no different than everybody else around me. He wants to please me. And protect me. My team is in an even deeper situation. Their jobs and careers hang in the balance. As part of my team they want me to like them, to think they’re smart and capable, and they all want more responsibility and authority. They know that’s the road to bigger salaries and all that goes with it. I know some of them are building resumes to get bigger jobs – jobs I’ll never be able to give them, but that’s okay. I’m proud to have them, and to help them – as long as they do remarkable work for me. Each of them is affected by this employee/employer relationship. It can’t be helped. They’re beholden to me. They certainly don’t want to get on my bad side. They want me to view them as highly valuable, and that can alter what they say and do. Even if they don’t think it does. Coming to work, side by side, day after day, they grow acclimated to the culture and my preferences. Even contrarians who start out quite contrary, grow more compliant over time. It’s just how things go. Then there’s the friend or business acquaintance who I reach out to. He’s got a social relationship or a semi-business relationship. He’s not likely to push me in any direction other than the one he senses I most want to go. Unless he thinks I’m making a really colossal mistake, but if I were making a colossal mistake I wouldn’t be reaching out to him at this point. Others would have piped up. As the owner our toughest decisions don’t normally involve a choice that’s a colossal mistake. It’s usually the decisions that have a much smaller degree of separation — not option A, which is of course the way to go if you want to be safe, or option B if you want to blow the place sky high. Our choices are usually far more subtle than that, which makes them even tougher. There is nobody else. Or is there? I never had anybody else. Armed with all these great people around me, involved in the process — they all needed something from me. A job. A client relationship. A social relationship, or a business relationship. Something. And I fostered dissenting opinions, but that’s difficult when people have spent any time with you. It’s only natural for us to communicate with people, and form opinions like the people around us. Especially when they’re in charge. It truly is a case of nobody able (or willing) to tell the Emperor he has no clothes. Even Emperors, or owners who don’t suffer severe bouts of vanity or arrogance, will influence the people around them to be like-minded. Mostly, that’s not a bad thing, but it’s not ideal for the very best decision-making. I was just a teenager when I first read Napoleon Hill’s Think And Grow Rich. The Internet hadn’t yet been invented. So I had never heard of a “mastermind group” before. It seemed like a terrific idea to me, and I wasn’t even a business guy at the time. I was just a stereo sales guy. But I saw the power of it. I participated in small groups formed either by industry associations or industry related groups. Those were really enjoyable. It was great to sit around a room with other people in the same industry. I enjoyed hearing what other people were doing about industry specific challenges or problems. Swapping ideas and stories was always worth the time I invested. When Honda Motorcars arrived in America with the first little bitty car I had a buddy who bought one. It was a lot of fun. Then the Accord arrived. That was a game changer. It took the world by storm and if you wanted one, there was a waiting list. I know because I tried to get one. Within just a few years Detroit starting making cars that looked just like the Honda Accord. It dawned on me that group think (we didn’t use that term back then) was prevalent in every industry, including mine. It’s why you never saw much innovation. We copy each other. We attend the same conventions. We read the same industry trade magazines. We buy the same inventory. We mostly do what the rest of the industry does. In time, we’d make ourselves feel better about it by calling it “best practices.” I’m not sure it ever was BEST, but it’s what we all did. Fast forward to my time away from the C-suite. I’m working with a client who is an elder law attorney. I had never heard of elder law, a specific area of law aimed at serving seniors or the children of seniors tasked with protecting their assets and seeing to their needs. It was a noble profession and I had an epiphany – what if I could get a small group of elder law attorneys together virtually in a mastermind group. I’m not an attorney, but I could facilitate helping them each grow their practice by introducing them to each other and having them focus on just one goal — to help each other grow their elder law practice. Elder law attorneys are geographic specific. They have to practice where they are. They meet clients in person. They’re licensed in the state where they operate. So getting a few of them together using online technology wouldn’t be problematic with them competing against each other. Fact is, they don’t compete against each other. I thought, if I had one elder law attorney here in DFW, one in Houston, a few scattered around California, and others from any state you can name — then we’d have something very powerful to help each of these attorneys grow their practice and improve their business. I even had a great name for it, Elder Law Elite. This was about 4 years ago. I had been a longtime fan of the moniker, “Together Everybody Achieves More” – TEAM – and I had used it through the years mostly in coaching kids’ sports. It was more than a moniker. It was completely true. I still think Elder Law Elite was a great idea, but if the target group can’t see it, I wasn’t terribly interested in pushing water up a hill. So I abandoned the idea, but never gave up on the value of a group of people who could help each other without any agenda other than to help each other grow their business, and their leadership. I was a bit jealous really. Any time I’d hear people talk about being in a mastermind group that delivered high value I was always envious. I’ve never experienced it. I’ve been invited to be in mastermind groups before, but they never gained traction. Mostly, because they’re tough to assemble, and many people wanted to join one for free. In my experience, they were worth exactly what I paid for them – nothing. And the people trying to assemble these groups seemed mostly clueless about how to organize a group and make it worthwhile. But the pain of small business owners kept looming over me. I’d see it every week. Listening to the pain in their voices. Hearing the stories of loneliness and defeat. It wasn’t hard to measure. I could call a business owner I’d never met before and ask just one question – “What’s one problem you wish somebody would help you solve right now?” – and then I’d shut up and listen. Some would talk for 20 minutes. Many more would talk for 45. And I was a complete stranger they’d never met before. It fueled me. Week after week connecting with lonely business owners who had never had anybody ask them that question. Or take the time to actually listen to their answer. Just somebody who cared. And didn’t judge them. This is the driver behind all my work – to be that guy with whom top leaders can be transparent. It’s a safe space for candid conversation about the issues confronting small business owners. Small, intimate groups are often helpful. People helping people grow as leaders. Owners helping owners overcome the challenges preventing them from being as successful as they might otherwise be. I know as a business owner we’re accustomed to making decisions with only 70% information (often less; sometimes more). Most have little to no awareness of working with a coach, or relying on a group of peers to help us grow – and to help us grow our companies. It’s not for everybody. That’s why it’s such high value. It’s extraordinary. Remarkable. Only the remarkable and extraordinary will see the value. It’s a self-selecting kind of a deal. Which is good. Kinda like explaining Evernote to somebody who has yet to see it. Know what I mean? P.S. I’m planning to launch the Bula Network Owners’ Alliance – the first group of just 7 small business owners. Members can be located anywhere in America because this is a virtual, online group. Speed and convenience are key. Are you interested in finding out more? Then visit this page and let’s have a brief phone conversation. No sales pitch. No pressure. Just meaningful conversation to see if we’re ideally suited for each other.